How far is the campsite from the lake? Camping La Ravoire is set back in a calm setting away from the main road and is located 1km /20 min walk to Doussard Plage. How far is the campsite from Annecy? 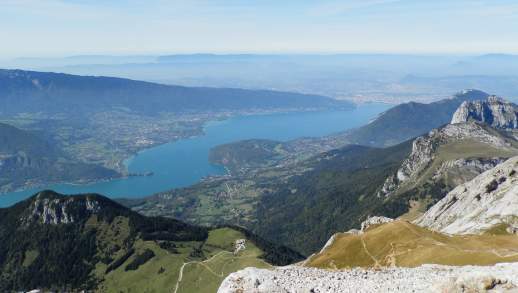 Camping La Ravoire is situated 20km south of Annecy near the plage de Doussard au bout du lac. Annecy can be reached by car, bus or boat depending on your preference, however we recommend the boat trip as you don’t have to worry about parking and traffic. Can I hire bikes on the campsite? Yes, we have onsite bike hire. You can rent bikes from us on a half day, daily or weekly basis – click here for details. Yes, we have recently had fibre optic high speed internet installed (we are the first campsite on lake Annecy to get this!). Each customer will be given one FREE Wifi ticket for 1 device for the duration of their stay. For extra devices it is 10 euros for the week for one device, 15 for two, 20 for three etc. Do you have a children’s club? No, we do not offer a kids club, however for the months of July and August we run a small free entertainment programme throughout the week, such as a magic show on Tuesday, bike stunt show on Thursday, Facepainting on Friday etc. Is the campsite popular with other nationalities? Yes, Camping La Ravoire has a diverse range of clients from different countries, therefore do not be surprised by this when you arrive! Please note that the last week of July and first two weeks of August are particularly popular with British clients. What size camping pitches do you have? We have a range of accommodation ranging from basic small 2 bedroom mobile homes to large 3 bedroom mobile homes with 2 bathrooms. Click here for the accommodation page where you can see in detail the accommodation that we offer. What animations/entertainment do you offer? We offer a small, free entertainment programme in the months of July & August. This includes a music concert every Wednesday evening with a late night pool party (until 22:00). Free diving taster session for children over 8 on Wednesday and Fridays and a weekly magic show/bike show/ face painting session. *Please note that the entertainment programme that we offer is small and if you are after a campsite with kids club and lots of activities then Camping La Ravoire is not for you! Is this campsite suitable for teenagers looking for activities? No, we are a small and quiet campsite and aside from Archery and diving we do not offer activities for teenagers, therefore unless your teenagers are happy sticking to the family, our small and quiet campsite is not for you. Arrival time is from 14:00 *please note that the reception is closed between 12:00 and 14:00 therefore if you arrive early you will be unable to check in until after 14:00. Departures for mobile home accommodation is 10am and camping pitches 12am. Is there a noise policy? Yes, we are a small and quiet campsite we ask for silence on the campsite after 23:00 out of respect to other guests. We have a security guard on the campsite in July and August at 23:00 who tours the campsite to ensure there is no noise, therefore please do not be surprised or offended if you are asked to keep voices down. Can I reserve the linen for my stay? Yes, you can add this option on the booking page or if you have already booked, you can send us an e-mail and we can arrange it for you.